To the tune of $42.5 million, the University of Alabama Crimson Tide transformed venerable Sewell-Thomas Stadium into a state-of-the-art facility. That enhancement made its opening one of the most anticipated aspects of this NCAA Division I Baseball season, and a visit to the ballpark shows that it lives up to the hype. While billed in some cases as a renovation, the effort to rebuild Sewell-Thomas Stadium was very intricate in scope. The only section of the previous Sewell-Thomas Stadium that was left intact during construction was a cement seating area behind home plate. Renovations were extensive enough to affect the placement of the playing surface, which was rotated to improve sightlines. This round of alterations—which addressed just about every aspect of the ballpark, from player amenities to the fan experience—began after the 2014 season, forcing the Crimson Tide to play out their 2015 home schedule at Hoover Metropolitan Stadium. The end result is a facility that should allow the Crimson Tide to be more competitive in the robust SEC. The team has played on the site of Sewell-Thomas Stadium since 1948, and the facility was completely revamped in 1978. Aside from some renovations over the years, the late 1970’s ballpark remained intact until this round of improvements. One of the best decisions planners made during the renovation process was to allow the new Sewell-Thomas Stadium to blend into its surroundings. With its brick façade, and neatly-landscape meandering plazas, Sewell-Thomas Stadium resembles many of the surrounding structures, including the Coleman Coliseum behind the right field wall and the Paul W. Bryant Museum across from the main entrance. The main entrance, situated on Paul W. Bryant Drive and Coliseum Drive, is the most striking section of the exterior, and its style is echoed in other areas. Down the left field line is the new hitting facility, a red brick structure that perfectly fits into the ballpark. Along the exterior wall in right field is Champions Plaza, a display honoring all of the University of Alabama’s athletic programs. 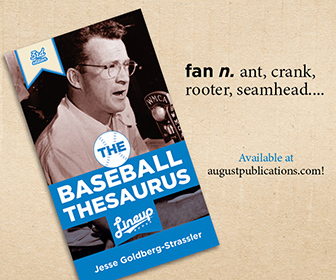 History is also an important part of the ballpark’s interior. Throughout the main concourse, there are banners and exhibits on the Crimson Tide’s baseball history, and the addition of the Alabama Baseball Hall of Fame this fall will add to that theme. Once complete, the Hall of Fame will be located on the concourse, near the main entrance. Most of the seating at Sewell-Thomas Stadium extends from the left field line to the right field line. Starting at third base and extending down the right field line, the seating is composed of two levels that are separated by a walkway. With this layout, the Crimson Tide not only provide good sightlines of the action, but allow for an atmosphere that is more intimate and therefore more conducive to the typical college ballpark. Another subtle, but crucial decision, was to rotate the seats down both base lines by 19 degrees to give fans a better perspective of home plate. Initial plans for the Sewell-Thomas makeover called for a 360 degree concourse. While there are walkways around the outfield, there is restricted access to the right field terrace, which is primarily reserved for students—in fact, it even has its own entrance gate. Therefore, most fans will want to head to left field for a different glimpse of the action, and those with children can check out the kid’s zone beyond the left field wall. The terrace is actually a very good idea, and could provide inspiration to similar projects in the future. Not only is it nicely planned and situated in relation to the rest of the ballpark, but it gives the impression of a laidback yet still energetic atmosphere. Even on a slower night, it is easy to see why the terrace is such a popular destination for students. Additionally, the Crimson Tide took the opportunity to introduce some premium spaces to the ballpark. Sewell-Thomas Stadium now features 12 luxury suites on the upper concourse, plus two club areas. The .525 club is a climate-controlled hospitality space that features seats on the upper end of the first base side, while the home plate club is an open-air space behind home plate. Within the seating bowl of Sewell-Thomas Stadium, there are two minor flaws that should be noted. Down the left field line is a small picnic area that makes for a nice place to sit down while grabbing a bite to eat, but the picnic tables sit too low to provide a good view of the action. Another is the support of the netting that covers the seating bowl. While there is a good case for the netting—a few screamers were hit the night of this visit—the middle of the netting down both sides is supported by a black beam that obstructs the view of a few lower level seats, particularly down the third base side. Overall, these are fairly minor quibbles. 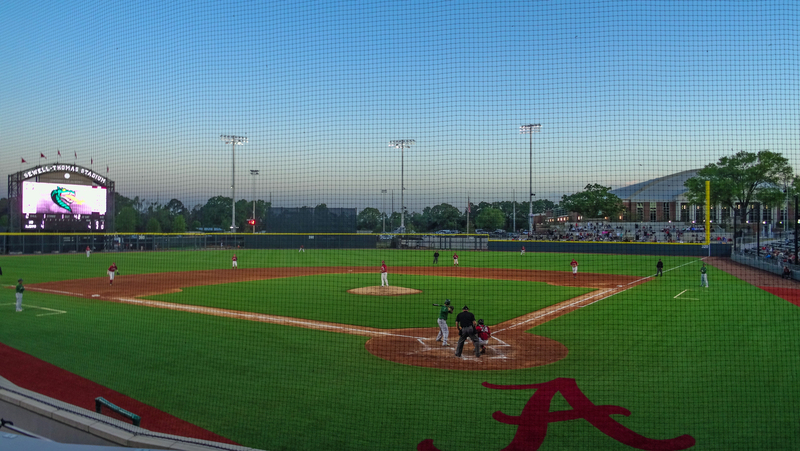 What the University of Alabama has done with Sewell-Thomas Stadium serves as a good model for how to overhaul college ballparks in a way that makes them more modern and cutting-edge, but at the same time preserves their intimacy and tradition.